In recent months, there has been a growing consensus that the tax code is broken and must be reformed or overhauled. Unfortunately, that’s where the consensus ends. Politicians are loath to eliminate provisions that garner them support, and the result is that the tax code is riddled with small loopholes that end up costing big bucks. One of the failures of the tax code is the unequal treatment of similar activities, such as the tax treatment of carried interest. Although only a few people even know what carried interest is, this provision costs the government around $1.3 billion annually. That’s a big break for just a few people. The fault lies not with the individuals who take advantage of these provisions, but rather with the legislators who enacted them and today, fail to eliminate them. Taxation of carried interest has been around since the implementation of subchapter K of the Internal Revenue Code, which governs the taxation of partnerships, in 1954. Though part of the tax code for over half a century, the taxation of carried interest only became a hot-button subject recently, when private equity firms and hedge funds rose in prominence in the financial sector. Private equity and hedge funds manage an estimated $1 trillion each, and private equity raised around $240 billion in capital in 2006. With such a large amount of assets under management, legislators and policymakers have taken a closer look at the taxation of their earnings. Carried interest (or profits interest) arises as part of a partnership arrangement. When a private investment fund is formed, it usually comprises two types of partners. 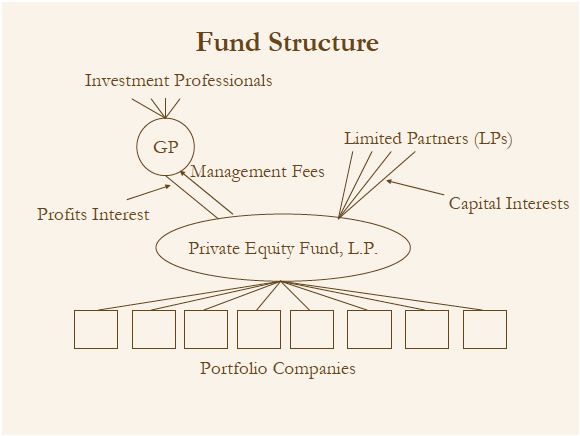 Limited Partners (LPs) contribute capital to the investment fund. General Partners contribute knowledge of investments, some capital (usually 1-5 percent of the firm's assets) and manage the funds on a day-to-day basis. It is important to note that partnerships are pass-through entities, meaning profits are not taxed at the partnership level, but rather each partner is taxed individually. General Partners are paid a management fee, usually around 2 percent of the fund's assets, for the day-to-day operations they oversee. This management fee is taxed at the ordinary income tax rate. When the fund turns a profit, LPs usually receive 80 percent of the profits (called capital interest), and GPs receive around 20 percent of the profits, sometimes not until a profit threshold (say, 7 or 8 percent) is reached. The share of the profits that the GP receives is called carried (or profits) interest, and is currently taxed at the capital gains tax rate. Most private equity funds have a lifespan of 5-7 years, so the income gained during this time is applicable for favorable long-term capital gains tax treatment, as opposed to hedge funds profits, which usually constitute short-term capital gains. Both long- and short-term capital gains rates are lower than traditional income rates. Many consider carried interest an unfair tax expenditure because it is taxed at the more favorable capital gains rate, instead of the usual income rate. The underlying issue is whether carried interest represents an investment in the partnership by the GP (in which case carried interest would be treated like capital interest), or if it constitutes compensation for services performed by the GP in managing the fund. Those who believe carried interest represents compensation for management state that GPs play a fundamentally different economic role than LPs, since they are responsible for managing the funds. Further, they argue that carried interest is compensation that is not principally based on a return to the GP's own financial assets as risk. Compensation supporters argue that GPs act in the same manner as an investment bank, whose employees are taxed at ordinary income rates. The alternate view is that GPs are being paid their share of the profits as a partner whose main activities are raising capital and investing it. In addition to contributing some financial equity to the firm, GPs contribute "sweat equity" - namely their management expertise. Supporters of this view argue that GPs act like entrepreneurs whose businesses are financed by third parties, and whose returns are taxed at capital gains rates. This is the position taken by current law. It is interesting to note that there is no consensus as to the character of carried interest in countries around the world. Some tax carried interest as capital gain, some ordinary income, and some as an alternate form of income. Currently, most view the grant of carried interest as a nontaxable event, as it may be difficult to value and thus cannot be considered "ordinary income" under the law. One option for reform would be to tax carried interest at the time of the grant. Under this scenario, when the GP receives carried interest, he would be taxed at ordinary income rates. Any further accumulation of profit would then be taxed at capital gains rates. This approach would require a trustworthy valuation system, and would be susceptible to large changes in taxable income as the assumptions behind the valuation system changed. One of the most commonly suggested options is to tax carried interest at ordinary income rates when it is realized. This approach would recognize carried interest as compensation for services performed in managing the fund, and would be similar to the taxation of non-qualified stock options. Senator Levin has introduced legislation that would tax carried interest as ordinary income. Finally, the "middle option" would be to tax the imputed interest on an implied loan the GP makes to the LPs. This option would tax part of the carried interest as capital gains and part of it as ordinary income. This option is a compromise, recognizing that GPs' returns are a mix of capital and labor inputs. It is, additionally, the most complex option. As it stands now, the favorable tax treatment for carried interest serves as a giveaway to wealthy hedge fund and private equity managers. There is no doubt that a GP’s role in the fund is fundamentally different from an LP’s, yet they are given similar tax treatment. Additionally, some GPs manage to reduce their management fee (and thus reduce the amount that is taxed at ordinary income rates) and increase their share of capital gains compensation. And there is no reason they should not do so, given the tax provisions governing partnerships. In treating carried interest as capital gains, the current tax code costs the government over $1 billion. Fortunately, legislators still have the ability to reform this provisio, and take a stand against giveaways to the wealthiest among us. By taxing carried interest at the ordinary income rate, the tax code would recognize the growth of the financial services industry and the role of professional fund managers. With tax reform on the horizon, this should be a no-brainer.